Who are the people who amaze and inspire you? The men highlighted in this blog are three of my favorites. One has become a sports legend at age 94, another performed for the first time on a broadway stage at age 85, and the third is business icon Steve Jobs. Each has taught me invaluable lessons and left an enduring legacy. The oldest is still with us, well into overtime! Mark Sertich is a 94 year old hockey player from Duluth, Minnesota. My father, George Dow Sr., is the second story. He was invited by Hugh Jackman to dance and sing on a broadway stage on his 85th birthday. The third is Steve Jobs, founder then reinventor of Apple Computer. I’ll be sharing inspiring videos, articles and insights about these incredible individuals. 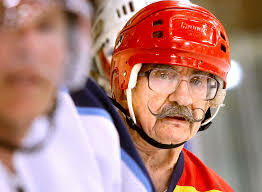 Mark Sertich (pictured above) is a 94 year old hockey player who was recently featured on the CBS Evening News. Just take a look at this guy and consider what you too might be able to do as a 40, 50, or 60 something youngster (by comparison). Please hang in there during the unavoidable commercial and as Mark’s story unfolds you’ll start believing that there really is a fountain of youth hidden somewhere near Duluth, Minnesota. George Dow Sr., my dad, was asked by Hugh Jackman to join him on a broadway stage on his 85th birthday. Take a look at how my sister Liz described that magical evening in her Huffington Post blog from last year. We believe that saying yes to Jackman’s invitation extended our father’s life by another seven years. It gave him an incredible story to tell (over and over). You might say that my father lived off the fumes of that experience all the way to age 92. “Although there have been plenty of laudatory comments made about Steve Jobs, I can’t help but think that Steve would be reprimanding us for our shortsightedness. Was he visionary? Of course. Did he have a profound impact on technology? Probably more so than any other individual of our time. But, he did not hit a home run every time at bat. Rather, what Steve Jobs exemplified was an unrelenting ability to use failure as a way to define success. Need proof? After leaving Apple in 1985, he spent the next 11 years trying to recreate success through the launch of NeXT computer hardware, then in the transformational launch of NeXT software, and then in the acquisition of Lucasfilm Ltd. During that 11-year period, he spent most of his Apple fortune trying to build the next great thing – and failed at nearly all of them. But then, through a bit of serendipity, Apple purchased NeXT for its Operating System and the rest is history. But here’s where it gets interesting. When Jobs went back to Apple they had some 350 R&D projects underway (typical, I think for managers who don’t understand the market and value everything equally as a result). Steve came in, interviewed the managers and reduced that list to 10. What made him so good at whittling down the project list? Failure. Newton, Apple III, Lisa, the Puck mouse, the G4 Cube, NeXT. He had plenty of mistakes. Some might characterize Jobs as being too visionary or ahead of his time. But the end result is – he learned from them all. Have these three men inspired you? Who knows, maybe you’ll be the next on this “outliers” list one day. Hang in there and keep shooting for the stars. You never know what magic might be just around the corner… at any age!